Ryan Farr of 4505 Meats, one of the entrée course chefs, is excited to share his appreciation for the whole beast with Supper guests. “There are so many cuts that you would not normally see—the really tender pieces—that you only get when you purchase the whole animal,” he says. So what’s behind this superlative beef? Happy cows raised on a whole lot of beautiful Mendocino grassland, by a family that keeps the animals and the planet in mind. 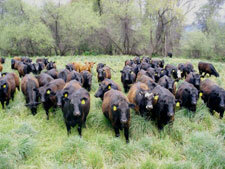 At the heart of their farming philosophy is rotational grazing, a practice developed by Allan Savory which, according to Provan, “is designed to optimize the production of grass as well as the health of the soil and the land by working with the cycles of how grass grows.” The pasture is divided into paddocks ranging from five to 200 acres, and the ranch’s herd of 500 cattle is moved every three to ten days to a new paddock. The family has gotten so good at farming grass that they purchase very little feed; Provan calls it “no input agriculture.” Their 2,400 acres, plus the nearby 6,000 acres they lease, allow them to grow about 300 tons of hay per year for their animals. The family only has to buy salt licks and, some years, a bit of alfalfa to augment the forage grown on the ranch. 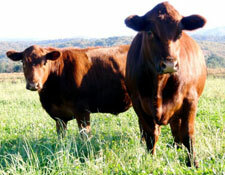 The way the cows are raised is what sets Magruder Ranch beef apart, in Ryan Farr’s eyes. “So much of it is about honoring the animal in the best way possible,” he reflects. “It’s something I’m proud of and don’t take lightly.” Magruder Ranch doesn’t take it lightly either, but they take a relatively hands-off approach. “We mostly leave them alone and let them be in an environment where they have good feed, good water, and space to move about. They’re eating what they’re designed to be eating as ruminants. Our animals are pretty much doing what they want to be doing, which is eating grass and hanging out,” Provan explains. About five years ago, the story goes, John Scharffenberger (of chocolate fame) proposed an idea to Mac Magruder (Provan’s father-in-law, pictured above). 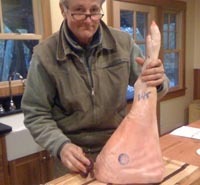 Scharffenberger was after a local Iberian-style ham, and Magruder was up for a challenge. Magruder captured ten feral pigs from Scharffenberger’s Northern California property (ridding the site of a pest that tears up the land and has no natural predators to keep it in check) and brought them back to the ranch. 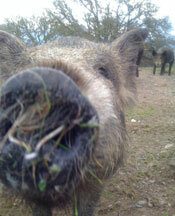 He then purchased five breeds of heritage hogs and began crossing them with the feral ones. The breeding program is still young, but someday, says Provan, the ranch may want to give its breed a name. Genetics aren’t the only thing that gives Magruder pork its acclaimed flavor. “One of the things that we think really differentiates our pigs is the amount of exercise they get,” explains Provan. They’re on about 200 acres of oak woodland, and they run around a lot.” What’s more, around this time of year, they fatten up on the fallen acorns that litter the forest floor—just like the Iberian pigs that inspired Magruder to start raising hogs in the first place. 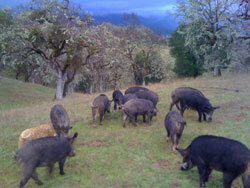 The pigs can’t survive on forage alone, and Magruder Ranch has found several sources for local feed. About half of their diet is okara, a byproduct of tofu making, which the ranch picks up from Hodo Soy Beanery in Oakland on the return trip from the slaughterhouse. A nearby cheesemaker makes weekly deliveries of 1,000 gallons of whey, another waste product the Magruders are turning into a resource. Finally, about 25% of the pigs’ caloric intake is California-grown whole-grain wheat. In addition to Farr and McNee, Charlie Parker of Plum will create a pork entrée, Melissa Perello of Frances will prepare a whole Watson lamb, Ravi Kapur of Prospect will feature goat, Craig Stoll and Lane Milburn of Delfina and Pizzeria Delfina will offer salmon, and Lauren Kiino will present the vegetarian entrée. Each table’s four-course menu will be a surprise, but the feast will surely be one to remember. Get your tickets now. 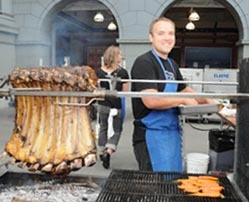 CUESA’s Sunday Supper supports the operation of the Ferry Plaza Farmers Market, a trusted partner for over 120 small-scale, local farmers and artisans, as well as the eaters who rely on them. This event helps fund CUESA’s education programs, including free cooking demonstrations, low-cost kitchen skill-building classes, the new Schoolyard to Market program, and sustainability scholarships that help farmers become leaders in their field.